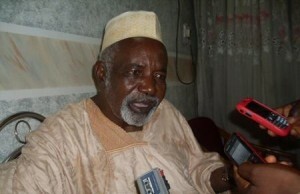 Second Republic Governor of Kaduna state, Alhaji Balarabe Musa has joined his voice to other Nigerians who suggested that next month elections should be shifted to allow the Independent National Electoral Commission to prepare very well, just as Comrade Isa Aremu, Vice President, Trade Union Congress, argued that the commission was prepared to conduct the elections. Their argument came up at a launching of four books written by Isa Aremu, yesterday in Kaduna. In his own view, Alhaji Balarabe Musa opined that since INEC may not be able to distribute the permanent voter cards to eligible voters before the scheduled elections, it would just be natural for the commission to postpone the exercise by more 60 days in order to address the issue. According to him, if INEC would conduct free, fair and credible elections, it must not ignore the need for young people who are just clocking 18 years to be captured in the whole process so that the outcome could be generally acceptable. Meanwhile, Comrade Isa Aremu, was of the view that in as much as the commission said it has no challenge bigger tha what it could bear, elections would still hold as scheduled. “INEC is doing very well. We should not because of insignificant challenges derail the entire timetable which has proven to be largely successful. We cannot be holier than the Pope. “I think we should stick to deadline given by the INEC. We should encourage them to have printed and distribute the PVC to over 70% voters. We should encourage them to arrive at their destination. The four books are: Reflections on Labour and Trade Union, Reflections on Industry and Economy, Reflections on Africa and Global Affairs and Reflections on Friends, Comrades, Heroes.